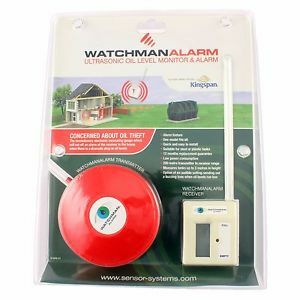 The Watchman Alarm oil tank alarm is our most advanced ultrasonic measurement oil tank gauge, that continually measures the oil tank level to help prevent fuel theft. A transmitter sets off an alarm when there is a sudden drop. (approximately 1.5cm per hour) then the on tank unit sends a signal to the receiver and an alarm will be set off on the receiver unit. In alarm mode the receiver unit will emit a siren type sound and the 10 bars will appear on the screen in sequence. The red LED will also flash. This can only be reset by plugging in and out the receiver unit from the mains. drop in one hour without the alarm going off.